Posted on Mon, Feb 6, 2012 : 5 a.m.
Joe Pantoliano said, "Good actors are a dime a dozen, but I want actors that are gonna be part of my team and collaborative." That reminds me of a comic line about cricket. The head commentator for a television broadcast says, "We are a team here and we'll do it my way." When you are in a small slam, you must take a dozen tricks, and since you are declarer, you get to do it your way. Your team -- your partner -- just hopes you choose a winning way. What would you do in this six-spade contract after West leads the club jack to dummy's ace? Your three-spade jump-rebid promised a good suit and more than minimum values. North bid four no-trump (Roman Key Card Blackwood), learning that you had the ace-king-queen of spades. You have 11 top tricks: six spades, two hearts, one diamond and two clubs. 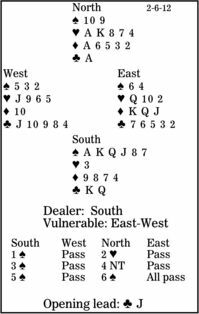 There are two chances for gaining an extra winner: the diamonds might be 2-2 (40 percent) or a third heart trick can be established, which needs hearts to break 4-3 (62 percent). So it looks right to attack hearts, but you can get home if either suit breaks favorably, which raises the probability to 77-plus percent. At trick two, cash dummy's heart ace. Then ruff a heart and play a trump to dummy's nine. If spades are 5-0, draw trumps and hope diamonds are 2-2. Here, though, ruff another heart. If they had not broken 4-3, you would have needed diamonds 2-2. But when hearts are friendly, draw trumps, lead a diamond to dummy's ace and cash the two top remaining hearts. You lose only one diamond.